This avocado dish is very easy to prepare and is ideal to serve as a delicious snack at any time of the day. Aguacates rellenos de camarones are a popular appetizer in Colombia and other parts of South America. Avocado is high in fat but the good type of fat namely oleic a monounsaturated fat, it is also rich in potassium, vitamin C and vitamin E. Shrimp is low in saturated fat is a good source of Niacin, Iron, Phosphorus and Zinc, and a very good source of Protein, Vitamin B12 and Selenium. It does contain a lot of cholesterol and for years people were advised to limit consumption to lower cholesterol but recent evidence shows that dietary cholesterol doesn’t have a significant effect on blood cholesterol. So it can be enjoyed in moderation as part of a balanced diet. Bring water to a boil in a small pot. Add the shrimp, cover and turn the heat off. Leave the shrimp in the water for 5 minutes and drain. In a medium bowl, place the shrimp, onion, salsa rosada, cilantro, parsley, salt and pepper. Mix well. Cut the avocados lengthwise and remove the pit, drizzle with the lime juice and sprinkle with salt and pepper. Place the lettuce in a serving plate and place the avocados on top. 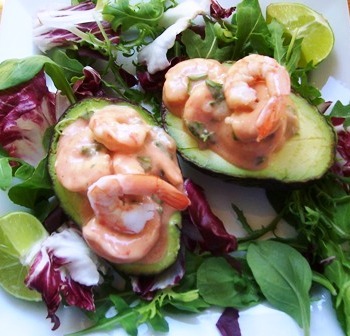 Fill each avocado with the shrimp mixture. Sprinkle with fresh cilantro and serve immediately. Salsa rosada or golf is a simple mix of ketchup and mayonnaise. It is extremely popular all over Colombia and South America, it is served with various snacks. It taste particularly good served with seafood. In a small bowl combine all the ingredients and mix well. For more wonderful Columbian recipes be sure to check out Erica’s Blog My Columbian Recipes.